What is it about an airport that makes me so happy? I know that if anyone is arriving or leaving, I am always the first to volunteer to take them. There is something about an airport that just makes me happy. Is it the excitement of a trip ahead? Or the anticipation? When we are traveling, I love to arrive a little earlier than recommended so that I can check in and then relax at the airport before the flight. 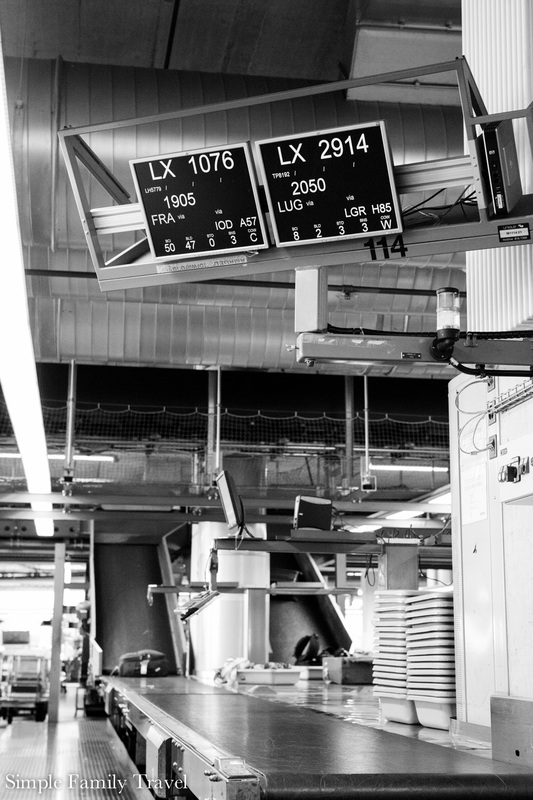 A couple of weeks ago, Zurich Airport invited me on their new “behind the scenes” passenger tour. 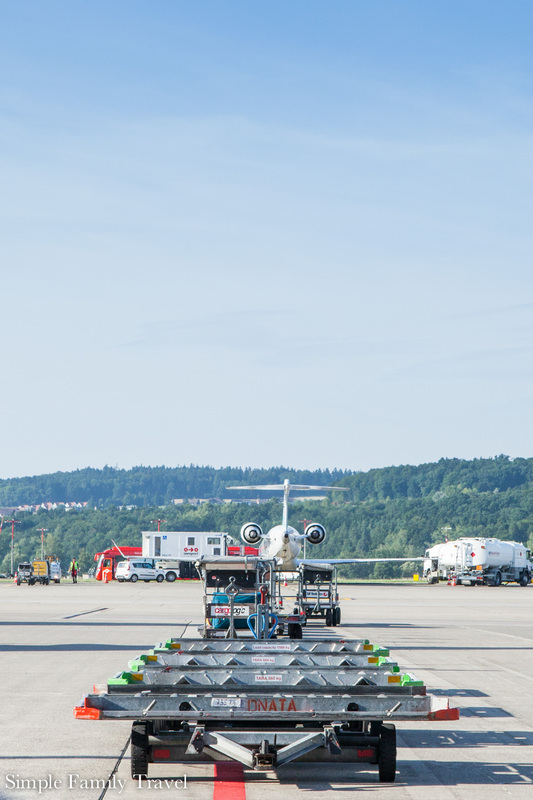 With more than 26 million passengers passing through Zurich Airport in a year, the airport must work like a well oiled machine to keep to the tight schedule of over 600 flights landing and taking off every single day. I was excited to take a behind the scenes look at how they moving parts get us to our holiday destinations safe and mostly on time. Our friendly and very experienced tour guide Heinz, started off our tour by explaining the airside centre. 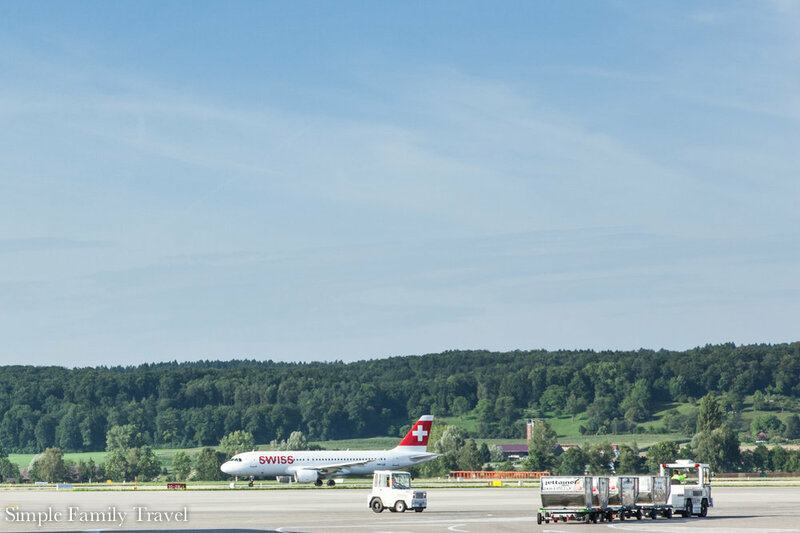 We explored the new outdoor terrace where you can watch the Swiss aircraft coming and going and get some fresh air before your flight. We were shown the numerous awards Zurich Airport has won over the years, they are the top 14th airport in Europe. What I was most impressed with was their contribution to the environment. They are trying to do their best to reduce emissions and are continually making the airport as environmentally friendly as possible. I noticed a lot of electric cars being used around the airport. On our way to the luggage area, we got to visit Family Services and see where families can let their kids play before a flight, change their nappies and find a place to feed them and just relax before the flight. There is one located in the airside terminal as well as one in Terminal E in the morning for peak long haul flights. Leaving the terminal is when it got exciting! We got to go outside and see the cars used to check the runways. Their lights are so powerful they could see a ladybird on the runway. Keeping the runway free of debrey is important for the safety of the aircraft. Things started to get really interesting as we headed down into the heart of the airport - the baggage sorting system. 12.5km long conveyor belts; 7.5km long tilt conveyors look after 30000 pieces of luggage every day. The luggage is strictly controlled to make sure it is safe to fly. There are systems in place to make sure that the baggage system is running at optimal efficiency. With workers on call ready to jump into action on their yellow bikes the moment something goes wrong. Over 250 cameras and 4000 sensors makes sure your luggage gets to the plane on time. The most exciting part of the tour was saved for last, being able to walk to where the aircraft are parked, or as Heinz called it “The Apron”. We got to walk under the gates and see the aircraft up close loading and unloading passengers and luggage. I had no idea how prams were brought to and from the aircraft door, now I know. So much goes into getting us off the ground and into the air. Without the airport working like clock work, there would be total chaos. Everyone has their role to play. 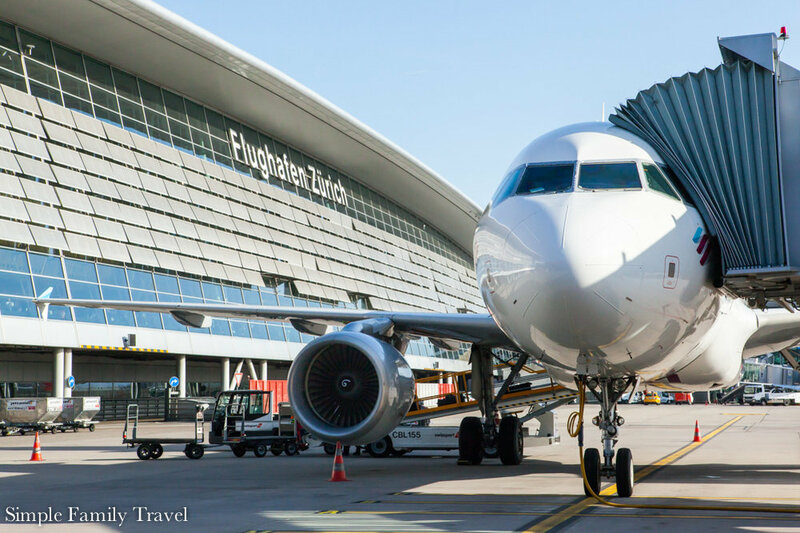 The passenger tour is a new offering from Zurich Airport, and is a great way to pass the time before your flight, or if you are apart of the 1/3 of passengers who are transiting through Zürich airport. The tour begins in the Schengen area of the airport, at the information desk opposite the duty free shops. The tour must be booked in advanced, book online at least 4 weeks before you hope to tour to avoid disappointed. The tour costs a flat fee of 200chf for a 90 minute behind the scenes tour and includes up to 8 people. So your entire group can enjoy the tour, or if you want some 1 on 1 time, thats possible too. If you are not a passenger at the airport, but still want to see things a little closer, why not book a open to the public bus tour. Its possible to book these in advanced (min 10 days), or try your luck when you are visiting the observation dock. The bus tour costs 5chf for kids (aged 5-15) and 10chf per adult. You must also pay the Observation dock entry as well. A big thanks to Zürich Airport for inviting me along. It was an exciting day and I am really am impressed about what goes on behind the scenes to get us and our luggage safely to our destination.